There is to a growing trend where VDI pilots go well until virtual desktops are being rolled out in production environments with thousands of users, when unexpected performance and cost overrun problems start to occur. Users start to complain about sluggish applications and ask for their laptops back. Attempts at fixing these performance problems by using traditional virtual desktop planning tools and by throwing more hardware at the problem quickly cause cost overruns, kill ROI and typically don’t resolve the performance issue. We are proud to announce a new groundbreaking VDI performance assessment service, eG Perform™, to help companies pre-empt and overcome virtual desktop performance issues so they can deliver on the desktop virtualization promise of flexibility, scalability and end-user satisfaction. eG Perform fills a huge gap in the market by identifying VDI bottlenecks and helping companies restore performance and deliver on the promise of desktop virtualization. In the early stages of VDI deployment, focus was on desktop virtualization viability. Pre-deployment assessments were used to determine the virtualization readiness of physical desktops. As the technology matured, the focus is shifting to performance assurance, right sizing and optimization of large scale deployments. Consequently, performance assessment has had to evolve from just focusing on physical desktops to a complete analysis of the virtual desktop infrastructure. Detailed reports and powerful analytics to right-size and optimize the virtual desktop infrastructure and increase ROI, complete with actionable insight into hardware bottlenecks, top users, top apps, critical dependencies, etc. 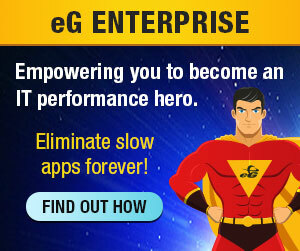 Integrated with eG’s on-demand cloud-based performance assurance platform eG-on-Tap, the eG Perform assessment service allows enterprises to baseline their current VDI performance, understand critical bottlenecks, and identify how they can optimize their virtual desktop infrastructure for peak performance and cost efficiency. Enterprises interested in trying out the service risk-free can get a complete eG Perform analysis for up to five servers free of charge for a three-week period. The service will deliver a comprehensive report documenting the current performance of the virtual desktop infrastructure complete with identified performance bottlenecks and areas for optimization.